The 2009 TTC Knitalong went off with much fanfare yesterday, as four teams converged from the West, North and East (East Team A was particularly awesome…not that I’m biased…), gathering yarn, prizes, stories, and laughter in their wake. By the time we all ended up at the final stops, our bags were full and our wallets were light, make no mistake. But we could not have asked for better weather, and everyone’s spirits were buoyed by welcoming local yarn shops at every stop, and knitterly cameraderie along the way. I was a team captain for East Team A (East had to split into 2 it was so popular, and even then the teams were pretty full!) along with Joyce. (Joyce and Michelle took the horns this year and did the organizing, even amidst incredibly busy “real life” competed for their attentions. And we are all grateful they did!) Our team had an early 10am start at the Naked Sheep, who were ready for us with a table brimming with goodies, and balloon-popping door prizes. From there we carried on to the Purple Purl, where Miko and Jen put up stiff competition as a welcoming committee with goodie bags and punch. Closer to the downtown core, our attention was needed by Lettuce Knit, Americo, and Romni, with a few scattered stops at the bead stores, ribbon shop, and much needed cafe stop for respite. I am actually starting to regret not purchasing that pima cotton flamme from Americo…oh help. This is what the powerful yarn fumes of a day like this will do. There is really not much to say about a day like this except that you know it is going as it should when it all seems too easy. 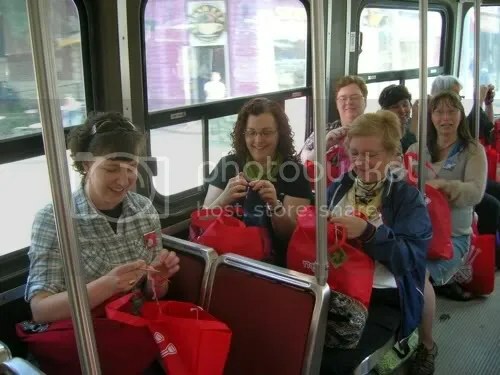 It was a great day, everyone on my team was awesome and we all just went along for the ride, filled our TTC Knitalong bags with yarn and goodies, and had much appreciated beverages at the end. I hope everyone had a blast. And if you haven’t had the chance to participate in an event like this, I hope very much that there is something like it close to where you live, or that you can do your own mini transit-knitalong-yarn shop day. Our local shops here in Toronto excel at what they do, and the Toronto knitting community continues to grow and expand in ways that make me very glad to live so close. And now…well, my stash has grown a bit. More on that once I’ve recovered from my yarn hangover. Better get knitting. I;d love to do something like that. Shame our knitting shops are a bit spread out here in Cornwall and public transport requires a lot of planning (though it can be done). That looks like SO much fun. Living in/near a big city has its advantages. Looks like fun! 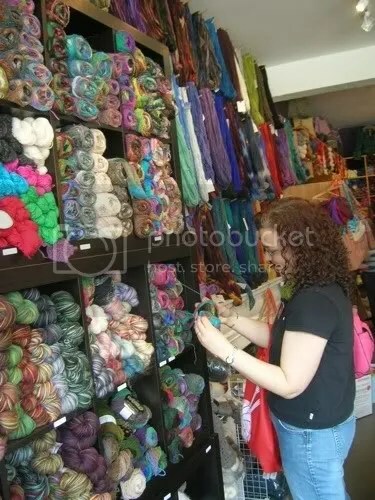 I’m looking forward to visiting Toronto (maybe in the fall) and checking out the fabulous yarn stores. I would love to do this in LA, but the stores are very spread out. Still, it is doable. Looks like a great day! I came along to this back in 2007 and wish I could join again sometime in the future. Maybe next year! Oh what fun! Wish we had stuff like this in Arizona. Thanks again for a great day with Team East A, sorry I had to leave early! You are so lucky to be able to so this. There’s only a couple of yarn shops here & they are not worth going to. That looks like so much fun. Here in Madison we have several LYS but our bus system is so painfully inefficient (at least, in terms of getting from one shop to another) I doubt it would work too well. That looks like so much fun! Once again, I’m kicking myself for not having the forethought to book the Saturday off! How freaking cool is Toronto?! You are so lucky to be a part of such a big knitting community!! Looks like you have so much fun,and the events that are organised are awesome. The only knitters that I know of in my town are from the Old Age Home! No younger knitters here! I nearly had heart failure at the sight of photo #5, those tables lined up with all the loot on top of them… holy moly! So… I spy a roving braid there… very pretty. Pinks to yellows to a bit of cream or white? eh? 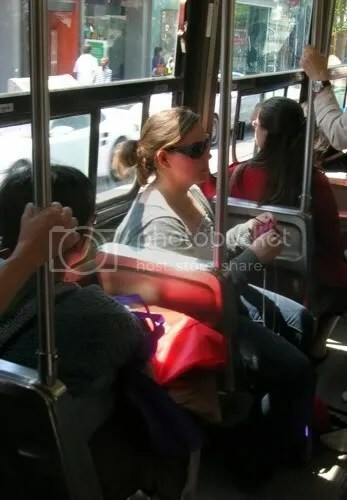 Although that one may not be yours I’m sure hoping you ended up with a pretty braid in your bag. I want to live in Toronto! I was on the West team and we had a great time too! It was great to meet you Glenna, and I’d have to agree that East Team A was the best (I’m not biased either, of course). You all did a great job of knitter-wrangling! A very good day indeed. An you were an awesome team captain, Glenna. Thanks again for your help and thanks for sharing those great photos! what an awesome day!! You got some wonderful shots of it. I can’t wait to do it again next year!! Wow! I’m so jealous. I wish we had something like that here. I just started reading your blog. Great job. Sounds like a great time! I am seriously going to consider combining my AGM trip with the TTC knitalong next year if the timing works out. It looks like so much fun!